Mongolian beef is another dish that can occasionally be found at the Chinese buffet. 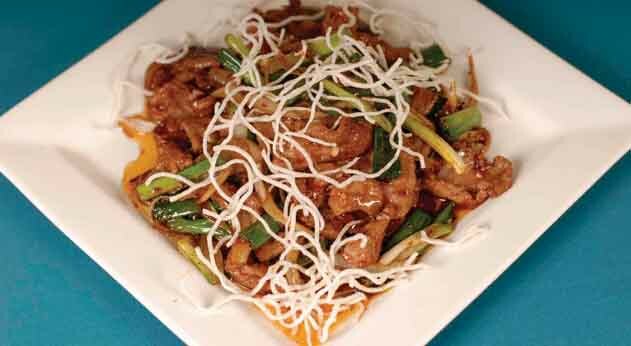 Despite its name, Mongolian beef doesn’t come from Mongolian cuisine at all but actually originated in America. Mongolian beef consists of sliced fried strips of steak coated with a sweet and spicy sauce and actually deep fried the beef strips and then added them to the wok, but this recipe calls for frying the beef in a wok first. Serve with white rice and broccoli. Step 1: To make the sauce- in a sauce pan heat 2 teaspoons of oil. Add garlic and ginger, stir fry 10 seconds. Add soy sauce, wine and water. Add brown sugar and dissolve into the sauce. Add red pepper flakes. Bring the sauce to a boil and boil for 2-3 minutes. Remove from heat. Step 2: Slice the flank steak against the grain into ¼” thick slices. Tilt the knife blade at a 45 degree angle to the top of the steak to get wider cuts. Toss the steak slices with cornstarch and let the beef sit for 10 minutes (this is very important, do not skip). Step 3: Heat up about a cup of oil in your wok to about medium heat. Add the beef slices to the wok and cook for 3 minutes (or use a deep fryer). spoon. Add green and red pepper to the wok and stir fry for 2 minutes. Add the steak back to the wok and pour in the sauce. Cook while stirring until the sauce began to bubble.